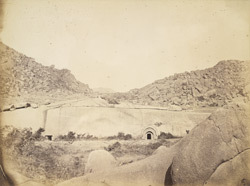 Photograph of Sudama and Lomas Rishi Caves at Barabar in Gya. The Sudama and Lomas Rishi Caves represent the earliest example of rock-cut architecture in India. They belong to the 3rd century, Maurya period. The Sudama Cave was dedicated by the emperor Ashoka in 261 BC and consists of a circular vaulted chamber with a rectangular mandapa. The Lomas Rishi Cave was carved out of a huge rounded granite rock and has an arch-like shape façade imitating the contemporary timber architecture. The internal surface is highly polished. The plain, rectangular entrance to the Sudama Cave is at the left in the photograph, the more elaborately-decorated Lomas Rishi Cave to the right.